After her outstanding collegiate career at the University of South Carolina ended in 2009, Gira Schofield was ready to pursue her lifelong dream of becoming a professional tennis player. 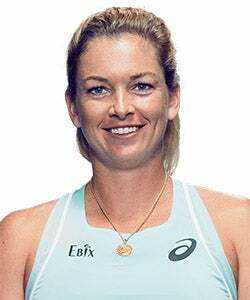 But a fractured vertebra kept that dream from becoming a reality, and after playing her last singles match on the ITF Pro Circuit in 2011, Schofield began looking for a way to stay close to the sport she loved. Returning home to Boca Raton, Florida, where she had been one of the section’s top juniors, Schofield began working at the Blackman Tennis Academy. When Martin Blackman became the General Manager of Player Development at the USTA in 2015, Schofield moved to Arizona to be closer to family, and she now coaches at the Mojo Tennis Academy in Scottsdale. Armed with a degree in exercise science and certified as a personal trainer by the National Academy of Sports Medicine, Schofield relishes the opportunity to work with high performance juniors, particularly girls. In addition to her position at Mojo Tennis, the 32-year-old also travels to national tournaments with blue chip eighth grader Stephanie Yakoff of New Jersey. Earlier this month, Schofield served as a coach at the USTA’s National Spring Team Championships in Mobile, Alabama for the first time, with her girls team, the Pirates, finishing third. In Mobile, I spoke to Schofield about her transition from player to coach, her college experience, her coaching philosophy and why she thinks more women are needed as junior development coaches. Colette Lewis: How difficult was it when you faced the end of your competitive career? Gira Schofield: It was very tough. I started when I was 4 years old, so I went through an identity crisis basically. In any sport, if you're competing and seeing yourself wanting to play pro and it's just not feasible, it's really tough. But I'm really happy now with coaching. I'm totally content with being a coach. I don't regret or miss playing. I love to hit and whatnot, but I'm a firm believer that everything happens for a reason, so I'm happy where I am in coaching now. But it was a very hard transition, emotionally for sure. You see yourself going a certain way and wanting certain things your whole life that you're building up to.